The Lawrence Conservatory keyboard department recently received a welcome surprise: a sizeable and unexpected gift earmarked for the purchase of a new Steinway D Concert Grand Piano. The gift came courtesy of the generosity of 1958 Lawrence graduate Kim Hiett Jordan. 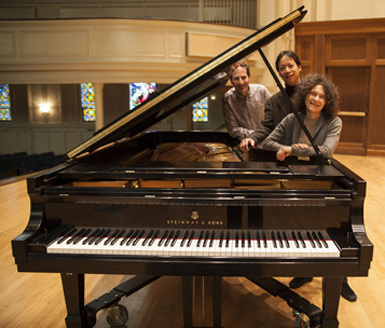 Members of the Lawrence Conservatory of Music keyboard department — Michael Mizrahi, Anthony Padilla and Catherine Kautsky — show off their new Steinway D Concert Grand Piano. Choosing a concert-quality piano, though, isn’t as simple as ordering the right model number from the Steinway catalog. Three members of the conservatory’s keyboard department — faculty members Catherine Kautsky, Michael Mizrahi and Anthony Padilla — all traveled to New York City to do some hands-on work selecting just the right instrument. The trio was accompanied by a representative from Appleton’s Heid Music, an authorized Steinway dealer. Leaving nothing to chance, the piano faculty recruited additional expertise from renowned concert pianist Richard Goode, who has performed several times as a guest artist at Lawrence. “We eventually narrowed it down to two beautiful instruments after playing two roomfuls of Steinway D’s,” explained Kautsky, current chair of the department. “We were privileged to have both Richard Goode and his technician along with us to help us make the choice. In the end, the decision was completely unanimous. The instrument we chose is wonderfully flexible and has a beautiful, warm sound that is large enough to fill the largest of halls. The magnificent new instrument has taken up residency in the Lawrence Memorial Chapel. It will be available to be played by students, faculty and a roster of distinguished visiting artists and enjoyed by audience members for years to come. The musical mastery of pianist Richard Goode returns to the Lawrence Memorial Chapel Friday, Oct. 21 at 8 p.m in a Lawrence University Artists Series concert. Goode’s appearance marks his third performance at Lawrence and first since 2002. Tickets, at $22-20 for adults, $19-17 for seniors and $17-15 for students, are available through the Lawrence Box Office in the Music-Drama Center, 420 E. College Ave., Appleton or by calling 920-832-6749. Acknowledged as one of today’s master musicians for the tremendous emotional power, depth and sensitivity of his music, the New York City native is renowned for his interpretations of Bach, Beethoven, Chopin, Mozart and Schubert. Goode, 68, probes the inner reaches of the works he performs, infusing every measure with the utmost expressivity. His musicianship combines boldness of the mind with depth of the heart. His discography includes more than two dozen recordings, including Mozart’s solo works and concerti with the Orpheus Chamber Orchestra as well as solo and chamber works of Brahms, Chopin, Schubert and Schumann, among others. He was the first American-born pianist to record the complete Beethoven Sonatas, which earned him a Grammy Award nomination. Goode has appeared with many of the world’s greatest orchestras — Boston Symphony Orchestra, Chicago Symphony, San Francisco Symphony, New York Philharmonic, Toronto Symphony, Orchestre de Paris and the Vienna Symphony among then — and has been heard throughout Germany in sold-out concerts with the Academy of St. Martin-in-the-Fields. 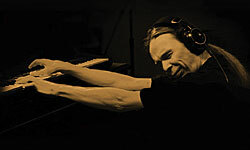 He was presented the first Jean Gimbel Lane Prize in Piano Performance in 2006, an award that honor pianists who have achieved the highest levels of national and international recognition and earned a Grammy Award in 1982 for Best Chamber Music Performance with clarinetist Richard Stoltzman. Following his Friday evening concert, Goode is generously conducting a master class at 10 a.m. and a lecture-recital at 3 p.m. on Saturday. Both events will be held in the Lawrence Memorial Chapel.